When I write up a race report, I usually start it within a week or two of the race. As with many projects, the race itself is just the short visible portion of a long process. I honestly don't remember when this story starts, I think it was when I was in high school, in the late 70's that I first read about the Longest Day at Nelson Ledges and realized that I actually had a chance of driving in a 24 hour race. Then again, it may have been when I was in college, in the early 80's. My memory starts running out of breath after 20 minutes and we're taking 20 or more years. But I first got my racing license nearly 17 years ago, and I had already wanted to run a 24 hour race for many years before that. When Thunderhill was built, I asked about the possibility of a 24 hour race there, and even started a mailing list to try to organize a 24 hour race on the West Coast. Shortly thereafter, I ran out of money, had to stop racing, and the list sort of petered out. Meanwhile, NASA started with a 6, later a 12 hour enduro at Thunderhill, in December. In 2003, the year of the inaugural 25 hour enduro, I didn't think that I'd have the resources to enter, but was invited to join a low budget team at nearly the last moment. Last years effort was by no means the highlight of my racing career. We had a heartbreaking series of mechanical difficulties ending when the car was totalled 10 hours into the race. In December of 2003 my Spec Miata was race legal but much closer to being a Street Miata than a Spec Miata. By October of 2004, with a brand new crate motor, and much work in general the car had been developed to the point where a good driver could hope for a podium finish. Mind you, I am not a top Spec Miata driver, and the best that I've done in SM was somewhat better than midpack, but considering that two weeks earlier, with the older motor, I was having some tremendous battles to not be in last place, the 5.5 seconds a lap that the new motor gave me was a significant improvement. About this time, I started looking around for codrivers and teammates for the 25 hour enduro. When I asked Steve White and his son Tom Sherrill, they enthusiastically agreed. Tom competes in ITC in a Datsun 510 and has won every race he has entered this year, as well as the last two of last year. I met Steve when he was rallycrossing a Cadillac Seville powered by an Olds 455. Being an unknown and unproven team, that was starting preparations late (only a couple months before the event) we had some difficulties lining up codrivers. Eventually we thought we had found two or three codrivers. A local Spec Miata driver, maybe his teammate, and the girlfriend of someone on the Spec Miata list. Sherrie even flew out from Texas a few weeks before the race to codrive with me in a three hour enduro, and learn the car and the track. A few days later, when Sherrie returned home, she found out that a friend had been saving her a spot in one of his spec miatas and decided to run with friends she knew instead of me. Meanwhile, the other two guys decided that they didn't have the money to run the enduro, even if we split a "driving share" between them. This left me, on November 16 (my sister's birthday), at least two drivers shy for a 25 hour race on Dec 4th (my Mom's birthday). I put the word out to various racing fora that I was looking for co drivers. Haas (Sherrie's boyfriend who had originally pointed her my direction) also pointed Bill Mosley (also from Houston) in my direction. Specmiata.com also got me Al Bell from Maryland. I believe Per Heldin, of Paso Robles found out about it from the nasaproracing mailing list. Bill also had a friend Jeff, who teaches at Bondurant, who had expressed interest, but he was off on vacation (a honeymoon?) at the time and I did not hear back from him until just a couple days before the event. At which point we had pretty much settled in with five drivers. The weekend before thanksgiving, I towed the racecar up to A & A auto in Brentwood, the Cadillac dismantlers that Steve White manages. On Sunday I drove back up there, and Steve, Tom and I started prepping the car for the race. Over the course of the next week, I spent way more time than I could afford dealing with logistics. We ordered the tires too late, and while we were able to get three sets of tires, it was too late to get any of them shaved. I also started working on ways to get my 5 gallon fuel jugs to pour faster. I essentially replace the 3/4" NPT pipe fitting in the lid with a 1" NPT pipe fitting, effectively doubling the area out of which the gas could pour. I also tried ordering some checkvalves (at $26 each) from Racer Parts Warehouse, in the hopes of having a bigger air vent that would not leak fuel, but unfortunately, when they arrived, it became obvious that they would neither work, nor fit the application. The previous week, we had replaced the front hubs and rotors, but the rear bearings needed to be pressed out. I had a spare set of rear spindles from a bunch of spare parts that I had bought, and I spent some time the next week getting bearings pressed in them. Thanksgiving weekend, the weeknd before the race, saw us working on the car both Saturday and Sunday. Jyri Virkki, drove up from Santa Cruz to help, Mike Bearnamotti, from Pleasanton showed up, and on Sunday, Per drove up from Paso Robles. On Sunday morning, Tom bought a couple of blue (to match the car) Neon lights, powered off of 12VDC, which we mounted to the trunk. It is very difficult to recognize a car at night, at the track, by just its lights, and we added these so that the crew in the pits could easily recognize the car if it was in sight. Of course, once the lights were mounted, working and tested at night, the only thing that we could possibly call the car was "The Blue Light Special". When I left Brentwood Sunday evening, the car was washed, waxed, gone over and pretty much ready to take out on track for the Friday practice day. Over the course of the next week, Steve and Tom applied the numbers and the racing stripe on the hood, as well as the A & A sponsorship decals. They did not, however, mount a Cadillac grillbadge to the front bumper. During the next three days, I got absolutely no paying work done. It seemed that I spent just about every waking minute juggling logistics, getting the team shirts done, and trying to take care of everything for the race that could possibly be done at home before the race. I didn't succeed, there was way too much. But, as it turns out, I got enough done. I won't chronicle the litany of minor problems that I confronted that week, there were a lot of them. None were catastrophic, or particularly interesting, they just took time. Bill Mosley flew into San Jose on Wednesday, and drove over to Felton. Shortly after he got here, we turned around, drove right past the airport, picked some stuff (like the spare motor) up at RC's shop, got plastic drawers at the hardware store, looked for some things at Fry's then drove up to Belmont (a little over an hour north of my house) to meet a friend who had picked up the shirts. On our way up there, we found out that they could have just been brought to the track. We also found out that the printer had screwed up and printed them in yellow and orange, rather than yellow and red. When I picked them up, I also found out that there was a miscommunication on the artwork, and it wasn't quite the right version that had gotten printed. Oh well. They still looked sharp. Bill was totally wiped out, so I dropped him off at his hotel went home and then stayed up most of the night packing for the weekend. It was freezing out, so I didn't pack the stuff in the van, but I got everything that was going packed up in various tubs, bins and boxes, ready to go. In the morning Bill helped me make an extension to the back shelf (futon) in the van to improve storage (and possibly sleeping if that proved necessary), pack the stuff, load my street Miata onto the trailer and meet RC at his shop. I was very impressed that we were only running a few hours behind schedule. Then Bill's rental car had the trouble light come on, a couple miles from RC's shop. The rental company said it just needed preventative maintanance and we should just drive it. So we went. And promptly got stuck in rush hour traffic. We got to Thunderhill pretty much exactly at dark. Coincidentally, the truck immediately in front of us was Tom, with the race car. Since we had a pit at the far (north) end of the paddock, just a few from the end, we were able to get paddock space very close to our hot pit. We had barely parked when Larry Marsala came up and asked us when we'd be ready to get the car teched. Half an hour later, the car was out of the trailer, Larry gave it the once over, and we had tech stickers on the car and our helmets. We headed into town, collected Josh and Kris and all had dinner at the Black Bear Diner. We weren't quite ready to go on track right at the stroke of 9, when the track went hot, but we didn't waste too much time. By the time it was my turn to drive, one of the set of tires that I had hoped would last all day had already been worn to the cords in a couple of small spots. I went out, and even though I only got about 3 laps before the lunch break, I made sure that that tires was completely unsusable. After lunch we went out on brand new full tread depth Toyos. They were almost as greasy as going out on regular street tires. We certainly weren't turning any record breaking laps. I think my best was in the 2:13s or 2:14s. On the other hand, it did allow us to "roadshave" one of the sets of full depth tires so that it wasn't quite so bad come the start of the race on Saturday. In one of those cosmic strokes of irony, one of Sherrie's codrivers rolled their car during practice. They got it back together Friday night, but she expressed dismay at some part ( I forget whether it was the windshield or the roof) being held in place with duct tape. In the paddock on Friday night, I realized that nobody had gone shopping for food yet. I wasn't invovled in working on the car, so I went into town to pick up some groceries. In short, I got a couple messages about an impending family crisis, and ended up not only not getting the groceries, but not getting to bed until well after 2AM. The flyby this year was much more impressive than last. As the national anthem was finishing we could hear the plane coming in from the distance. Just as the song finished an F-15 came in something like fifty feet off the deck, on afterburners, rotated onto it's tail, and went straight up, rolling back into a loop just below the cloud ceiling. I'd be surprised if there was a guy past puberty at the track that wasn't tumescent after that. I got to drive the first shift. The advantage was that I was guaranteed seat time. The weather was dry, and the tires had far more tread than traction. I know that you aren't going to win a 25 hour race in the first lap, or even the first hour, but that there is a tremendous opportunity to lose it. I cannot describe the frustration of seeing all of the other cars go charging off, even ones that I should be faster than, but forcing myself to take it easy, be conservative, and above all, not wreck the car. I will note that there were quite a few cars that went charging past me at the start, which I later passed as they went agricultural into the weeds. Sometime into my shift, I was finally catching someone, but waiting for a safe and clean opportunity to pass. I almost got past him going into turn 8 but a much faster car divebombed me, started a pass on him and then aborted, causing me to have to hit my brakes and get real fancy to avoid an accident. The other car and I charged up the hill, I didn't have enough speed for a pass in 9, but I had momentum on him coming over the top. I was pretty well committed to him when I saw a single yellow flag in turn 10. The rule on a single yellow is that you aren't allowed to pass between the yellow flag and the incident. I was committed to my pass, so I completed it well before the station. I came around turn 10 and there were double yellows, signififying a full course yellow at turn 11. And at the other stations as well. I had unwittingly passed under a full course yellow, and was brought in for a 30 second penalty some laps later. We had a couple other full course yellows (with the flagger in 10 only showing a single yellow)and I cam in 120 miles later, with room for only 9 gallons in the tank. I should have stayed out at least three more laps, but we would be having difficulty the whole with a fuel guage that read empty, even with the needle significantly below the empty mark, the whole race. Tom went out next, and was assessed a 1 minute stop and go for passing under the yellow. Since Tom hadn't passed anyone, he was certain that he hadn't passed under a yellow, but it was too late to do anything at that point, but protest it so we wouldn't get a third infraction penalty if it happened again. Bill and Al traded the third shift so that Bill could get more practice at the track during daylight. Bill also got some pretty good dicing in with Sherrie, in the number two car.I was envious because dusk is my favorite time to race. There is something incredibly peaceful about racing just as it gets dark. Per Heldin got the first all dark shift, with Al Bell finishing the driver rotation. I got back into my car for my second shift at about 7:25. My first couple of laps in the dark were embarassingly bad. I eventually got into some sort of rhythm. Al was getting fuel starvation on his last lap, so I wanted to come in at a point where 10 gallons would just exactly fill the tank. This, of course, was the shift where the crew radio died. They could hear me, but it didn't have enough juice to transmit. This was the pitstop where I came in, and they weren't ready for me. I thought that the track might go to a full course yellow and didn't want to be caught out with an empty tank. When they weren't ready, I went back out for another lap rather than sit idle in the pits. When I came in, there was only room for 8.5 gallons. In retrospect these two early stops of mine, had they been done at, or after the 10 gallong mark, would have extended our range long enough we would not have needed a splash and go in the last session. It is amazing how clearly we can see things in hindsight, isn't it? I had initially planned to sleep after my third shift. I'm usually awake until two or three anyways. But when I went into the RV to change, and RC had cranked the thermostat up to arctic, a nap seemed like a really good idea. That, of course, was when everybody had to come into the RV to change, use the plumbing or whatever. Even so, I got several pretty solid hours of sleep, waking in time to be "on deck" during Al's driving shift before mine. At the end of Al's shift, we fueled the car in the pits (you can't fuel in the paddock) and then Al took the car back paddock where we put on four brand new full tread depth tires and a new set of front pads. It turned out that we had about a third of the material still on each of the pads, the thinnest was about ).135" and the thickest about 0.190" out of 0.365". In theory, the pads might have lasted until the end of the race. During that shift I realized that 30F is pretty much the ideal airtemperature for driver comfort in a closed racecar. By the end of my shift I was getting a bit hot and sweaty, but I was pretty comfortable most of the time. I also noticed that when the track is under 30F, full tread depth tires don't get nearly so greasy as they do when the track is warm. Unfortunately my radio flat out did not work that session. I couldn't hear them, they couldn't hear me. I ended up coming in way early because I saw that they were ready for me. Again I came in with only room for 9.5 gallons in the tank. Which was about 2 laps earlier than I could, or should, have. At the next driver change, we made sure that both the pit radio and the "new" car radio talked with each other and swapped the working radio in, and restored radio communication. We continued rotating through the drivers. And Steve and Jyri ended up staying up all night. I was envious of Bill because he also got to drive the sunrise shift. I've never driven as the sun came up. I did get some pretty cool photographs at sunrise. I went to a different location to get a good shot, then eventually found out that the best angle was from our hot pit after all. Al went out on his last shift with almost exactly two hours left in the race. Or, about 20 minutes longer than a Spec Miata will run on a tank of gas. After a little over an hour, we knew that there would be room for at least five gallons of gas in the tank, and brought him in for a "splash and go" pitstop. We did the pitstop in 38 seconds, and even got some applause for it from folks watching in adjoining pits. At the time we were in a battle for position. We didn't know whether it was for third for fourth place, but every second counted. In the end, we took fifth in class of 23 cars with 604 laps, the fourth place Miata had 605 and third had 606. We finished thirteenth overall out of 62 cars, many of the cars we beat were in "faster classes" and 28 of the nearly 50 cars we beat had faster "best lap" times. Our crew for the weekend, in no particular order were Steve White, R.C. Laton, Edward Choh, Jyri Virkki, Dean who's last name I never caught, and Josh and Kris Assing. Almost none of them knew each other two weeks, or for that matter two days, before the race. Several had never crewed at a car race before. Even so, they all came through and did an amazing job, earning us a respectable fifth in class in a race where even finishing is an accomplishment. Dec 4-5 2004 will mark the second running of N.A.S.A. 's 25 Hour Enduro. This just happens to be the longest roadrace in the world. LeMans is only 24 hours long. Last Year The enduro received a tremendous amount of news coverage. Last year, I didn't think that I'd be able drive in it, and at the last minute, I got an offer to drive with a low-bucks effort team. In short, it didn't work out to well, and this year, I want to do better. Much better. My racecar is not the fastest Spec Miata on the track. 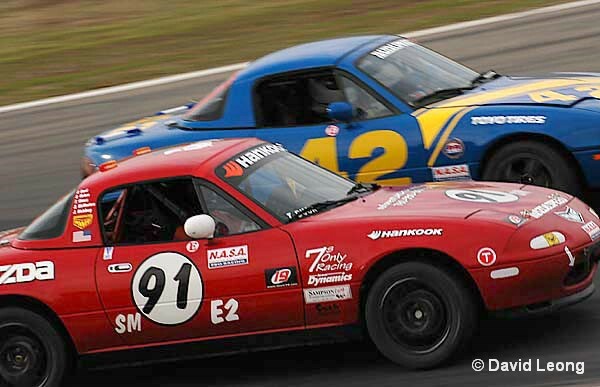 However, Spec Miata is such a competitive class that only a few seconds a lap will separate the winner, from midpack. In an enduro, especially one as long as this, you don't win by turning the fastest lap, you win by turning reasonably fast laps and by not breaking or crashing. A single spin, and stop in the pits to check things out, even if you don't have to fix anything, will eradicate an hour's worth of "3 second faster" laps. My strategy is to assemble a team of four to six, competent, trustworthy drivers, who can turn respectable laptimes, without crashing, breaking or putting undo wear on the car. In addition to the drivers, we are going to need crew. Crew and other resources can be shared with other cars on the team. In order to make sure that the team is well trained, and understands what to expect in an enduro, we plan on running two shorter enduros before the 25 hour. The RDC is sponsoring their 45th annual 4-hour enduro On November 7,2004 at Thunderhill. One week later, there will be a 3 hour nighttime enduro also at Thunderhill, to give the team practice racing at night. We will have a very busy 3 weeks after that, preparing the car for the most grueling roadrace around. Not only is it the longest, but unlike the second longest held close to the longest day of the year, this is held close to the longest night. Artist: The rules require a team uniform. The plan is to make and sell extra T-shirts with the team logo, to help raise money for the effort. We need someone with artistic ability to help design the shirt. Pre-race logistics, fundraising etc. : A tremendous amount of planning needs to go into this effort. In addition to all of the support at the track, we need someone who can help make sure that the t-shirts get printed, distributed etc. Accounting:This isn't going to be cheap. We'll have several drivers sharing costs. We hope to be raising some sponsorship money, raising money from selling shirts. Plus there are the costs of race entry, food for the drivers and crew, uniforms, not to mention gas, tires, brake pads and everything else that gets used up during a race. Fund-raising, publicity etc. :We need people to help raise money, to sell T-shirts, to find sponsors. I realize that when it comes to marketing, I'm a pretty good engineer. These days, webpages can be critical to the success of marketing something like a raceteam. As you can tell, I'm no more a webpage designer than I am a graphic artist. Crew Chief:The crew chief's job is not to work on the car, but to make sure that the things that need to get done happen. Pit Mom:What the crew chief does for the car, the Pit Mom does for the crew. The Pit Mom makes sure that food gets cooked, that people eat and drink, that the drivers get ready in time for their shift. Crew: We'll need people to change the tires, to fuel the car, to help fix things that break, to help cook for and feed the crew. The above are only the highlights of what needs to be done to make this happen. It will be hard work, and a tremendous challenge, but like all challenges, the rewards for having done it are immeasurable. If you would like to join our team and help out on this race, send me email at lrc@red4est.com, or join the team mailing list.